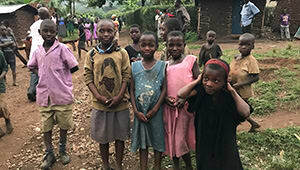 The West Virginia University Chapter of Engineers Without Borders initiated a project to provide safe water supply for residents in Kabughabugha village and a health clinic in the Kasese District of Uganda. The village of Kabughabugha has an estimated population of 7,200. Sanitation and hygiene best practices do not occur in the village, as there are no wash houses or toilets. To obtain water for drinking, cooking and washing, women and children must walk up to five kilometers multiple times a day to the water source, which was untreated. This journey is through the Rwenzori mountains, rugged, steep and challenging terrain, and the villagers do this barefoot or in flip flops. The water buckets were left around the ground, thus leaving them covered in mud and other matter. The EWB international project team performed assessment on the water source near the village in August 2017. This included conducting water testing, topographical mapping, GPS mapping, community interviews, and inspection of local construction materials. Which YOU helped to make possible! Having spent the Fall 2017 semester designing a sustainable water system and developing a strategic plan for Water, Sanitation, and Hygiene (WASH) education, the team is making preparations for future travel to implement the system design and teach villagers about best WASH practices. This is where we are asking for your help. While water treatment and access is important to improving the living conditions of Kabughabugha, the education component of the village is most important to provide and maintain safe water access for the residents and health clinic. The project will continue to work with village leaders and health clinic personnel to provide training on water sampling, monitoring and analyses, and WASH programming for local residents. Ultimately, after the water is supplied effectively to the villagers, wash houses are to be built to allow villagers to put their newfound knowledge of best WASH techniques into practice. Please consider making your gift today! Could provide meals for multiple students on the trip. Helps to provide much needed materials. Provide one clean water access tap. Providing in depth training for the village of Kabughabugha. Build one catchment chamber for water source collection. Build one 10,000 liter clean water access tank. Build one 15,000 liter clean water storage reservoir. This level could help build the required gravity flow pipeline.